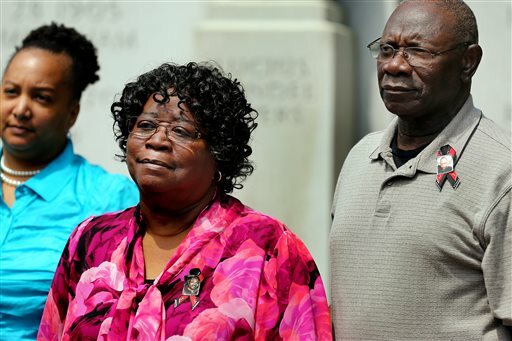 CHARLESTON, S.C. (AP) — It didn’t take long for a grand jury in South Carolina to indict a white former city policeman for murder in the shooting death of a black man who tried to flee from a traffic stop. State investigators presented the case against former North Charleston officer Michael Slager to a Charleston County grand jury on Monday and prosecutor Scarlett Wilson announced the indictment a few hours later. A bystander’s cellphone video shows Slager firing eight times as 50-year-old Walter Scott tried to run away on April 4. The killing enflamed a national debate about how black people are treated by white police officers. But it caused no unrest in North Charleston, where community leaders and Scott’s family praised the government’s swift response. Slager was charged with murder by state law enforcement agents and fired from the police force immediately after Scott’s family released the video. The indictment of Slager is the fourth in less than six months in which a grand jury in South Carolina has agreed that white officers should stand trial in the shootings of black men. The grand jury that reviewed the shooting of Michael Brown by officer Darren Wilson in Ferguson, Missouri, met weekly for three months, hearing from 60 witnesses. Saint Louis County Prosecuting Attorney Bob McCulloch then spoke nearly 45 minutes, describing how jurors “poured their hearts and souls into this process” before deciding not to indict anyone in Brown’s death. Angry protests and riots ensued. When riots in Baltimore followed the death in police custody of another young black man, Freddie Gray, State’s Attorney Marilyn Mosby charged six officers with crimes and then spent two weeks presenting evidence to a grand jury that affirmed nearly all the charges. “To the youth of this city, I will seek justice on your behalf. This is a moment. This is your moment,” Mosby said in a passionate speech. Wilson, by contrast, made no speeches. She called reporters to her office to announce the indictment, and made very few comments. Slager said he initially tried to stun Scott with his Taser when both men scuffled over the stun gun and he fired his handgun at Scott in self-defense. The video shows the men briefly scuffling before Scott runs away and the officer fires at Scott’s back. Slager, 33, faces 30 years to life without parole if convicted. Wilson said the death penalty doesn’t apply because there are no aggravating circumstances such as robbery or kidnapping. Walter Scott’s brother Rodney Scott said the family is “very happy and pleased” with the indictment. “This is just an example of if you keep the faith, even in the darkest times, you will see the light,” said Chris Stewart, a lawyer for Scott’s family who is preparing to file wrongful death civil suit against the city. “We are going to patiently wait for the criminal trial in this case and we are going to patiently wait to see if the city, the police department and the chief are going to take responsibility in the civil suit,” Stewart added.